A few years ago, some proclaimed PC gaming was dying out to consoles. The same was said about laptops following the advent of tablets. And yet, 2015 is shaping up to be the one of the most exciting years for all computers from Macs and desktop PCs to Windows laptops and Chromebooks alike. Beyond Windows machines, Chromebooks have moved on up to the affordable 15-inch multimedia machines. All the while, rumors suggest an even thinner Retina MacBook Air is on the horizon. And that's just what's been revealed in the first half of January. There's even more good news for laptop and PC users to come. Intel's long awaited 14-nanometer Broadwell-U processor is finally here and it has brought with it a whole new class of thin and light laptops. 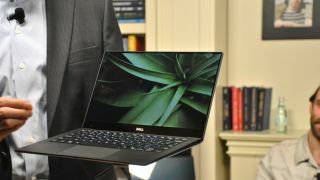 The recently announced Dell XPS 13 is an amazing feat of engineering that puts a 13-inch QHD (2560 x 1440) screen into the body of an 11-inch laptop. All while Dell's new machine is even smaller than the incredibly miniscule MacBook Air. Likewise, the Lenovo (with a huge helping hand from NEC) has created the Lenovo LaVie Z, a laptop that weighs little more than an iPad. Beyond Ultrabooks, Intel has bold plans for Broadwell-U. The Verge reports we'll see new 14nm processors across Intel's entire line, including Celeron, Pentium, the Core i series, as well as updated Core M chips. The size of the new 14nm transistors has been nearly halved, compared to 22nm silicon found in Haswell chips, making them more efficient in both power draw and heat emission. When it comes to real life applications, Intel claims Broadwell-U can power a laptop through an additional 90 minutes of video playback, according to AnandTech. Looking even further into the future, Intel's next CPU architecture, Skylake, is expected to come within the second half of 2015. Like Broadwell-U, Intel's 6th generation Core architecture will follow the same 14nm production process. Aside from the performance increases in battery life and power efficiency, Skylake also promises to bring some new cord cutting features, like wireless charging. What's more, PC World reports Skylake will also be able to push data and display signals wirelessly over WiGig (think wireless gigabit). This standard is supposedly 10 times faster than the wireless direct, or WiDi, standard primarily found in connected printers. Potentially, WiGig could remove the need for dangling HDMI and USB cables. Skylake could also be an even bigger to desktops, as Intel's Kirk Skaugen relayed to TechRadar, Skylake will present a "significant increase in performance, in battery life, in power efficiency." The smaller transistor design is also expected to run even cooler than Haswell parts, making it an easy shoe-in for smaller systems, namely Steam Machines. In the last few years, Haswell has helped smaller PCs become the norm from micro-ATX cube computers to tinsey mini-ITX towers. Broadwell, as well as Skylake, will help proliferate the idea of small computers even further. But make no mistake: full tower cases still have their place in the world for liquid-cooling enthusiasts and users who require dozens of hard drives.